May I know you, may I know myself! Someone might come over from the dark side from time to time, or vice versa, but overall, things are nice and neat. The people in Jane Austen’s books have astounding self-knowledge; they seem to know whether they’re good characters or bad characters before the story begins. This is convenient because they can continue to do good or evil for the rest of their lives and fulfill their purposes in the story. No one seems conflicted about who he or she is—or who he or she is supposed to be. When I read the Bible, sometimes I catch myself thinking of its stories in a similar way. The people I read about seem to have it all together. They seem to know who they are and discern their purposes on earth as if God had inserted microchips containing this information into their brains at birth. After all, they lived in “Bible Times,” right? Many of them had physical encounters with God or interacted with Jesus. Surely that gave them an edge in figuring out their lives and what they were doing here in the world. The thing I routinely forget as I read the Bible, however, is that these people were human. These people were not the created characters of the writers. They were not fabled placeholders that represent right and wrong. We cannot read the Bible this way, as we might read Jane Austen, without serious misinterpretation. The Bible is not the story of God’s interaction with fictional Everyman and Everywoman. It is a collection of stories of God’s encounters with humanity. These recorded lives were not prototypes. While we can learn much from them, these lives were not airbrushed cover models that God put on the cover of Healthy Christian Man or Ideal Godly Woman. These were humans. They journeyed. They learned. These humans in the Bible had to notice their redeemed selves. They consistently had to trust how God was reshaping their broken humanity into integrated, God-glorifying life. Look at the disciples, the ones closest to Jesus. They worked, played, ate, and traveled with him. They messed up. They shipped out at times and, on occasion, they shaped up. Even those closest to Jesus didn’t immediately become fully purposed, whole super-people. They had to learn to trust God’s process of reinventing their lives as they followed Jesus. Even with the opportunity to encounter God and his Son in miraculous ways, they still had to take time to discover how God was reshaping their lives. The biblical account of John the Baptist can teach us how to notice and lean into our God-repaired selves. John would have been a perfect Jane Austen character because he certainly had the “good-guy-who-has-it-all-figured-out” credentials. John had amazing encounters with God and his Son, Jesus. After all, he was Jesus’ cousin, and he even leapt in the womb when he was near Jesus, virtually pointing toward the Christ from conception. An angel who visited John’s father confirmed that John was to be special. What more could you want as far as credentials go? John must have immediately known that he was to be the one prophesied in Isaiah 40:3, the voice who would make straight in the desert a path for God. How nice for him to know his whole purpose—his true, God-given role—from the beginning. But what else do we know about John? He didn’t follow in his father’s footsteps by signing up for the Jewish priesthood. He was religious, one could say, but in his own wild way, living an ascetic lifestyle in the desert. He rebelled against traditional Jewish life, rebuking his people with a scorching “Repent!” Then there’s that troubling story about John later in life, when he sent one of his followers to ask Jesus if he really was the one who would re-create their lives. John wanted to know if he’d goofed up, if he’d been pointing toward the wrong person all along. He wanted to know if his efforts would matter for good or for evil. Yet, John used that verse to tell the Pharisees who he was. Why did he do that? How did he have the faith to believe in God’s leading in his life? By using this Scripture to explain himself and his purpose to the Jews, John—unintegrated, rebellious John—dared to think God could use him to prepare people’s lives for the ways Jesus would work in them. John recognized his humanity and, at the same time, hoped that the way God had moved him to live and teach would somehow point to the One who was to reveal God in human form. He dared to believe that who God challenged him to be and the lifestyle to which he was called would actually play a part in the grand interaction between God and man. He did not know for sure if he would land a part in this drama, but he declared in faith his willingness to accept a role. What does this mean for us? When we wake up in a conflicted funk, when we’re bummed about who we are, or when we’re missing the point to life, what should we do? Do we give in to our insecurities and disengage from life? Do we downshift into maintenance mentality? Do we simply get through the day until we can crawl back under the covers? What practical things can we do to notice and trust God’s activity? First, I believe we can welcome God’s reconciling activity in our lives. This means we notice, maybe for the first time, the way God reaches out to reconcile us to himself. He took the initiative to heal our broken humanity by becoming humanity himself in the person of Jesus Christ. In this sense, living a Christian life means simply appreciating God’s sacrifice for the sake of our wholeness and welcoming his transformation of our lives. This conversion is continual. Second, we can take at least five minutes for ourselves. This time might include a simple prayer of our willingness to “lean in,” even though we’re currently unable to see God’s purposes for us on this particular day. We might ask God to give us a glimpse of his view of this day. Or we might take time to recall aspects of God’s character that we know to be true or remember God’s past activity in our lives. Through these exercises, we reaffirm our trust in his character and his activity, remembering that his work in our lives will not be in vain. Another way we might engage God’s work in our lives is to enunciate three ways we presently feel God’s work in us, noticing the ways he’s changing us. We can observe similarities, differences, and correlations, noticing how his actions shape us for what we are currently encountering in life. Additionally, we might enunciate what God has impressed us to do and be throughout the course of our lives. We can remind ourselves that these goals, while not necessarily guaranteed to bear immediate fruit, are still worth striving toward because of the worthiness of the One who impressed them upon us. We can practice these things as we learn to take part in the eternal interaction between God and man, all the while keeping the grace God gives us before us. Once, when visiting a large Baptist church in Texas, I heard a pastor give this invitation at the end of his sermon: “With all that you are and all that you know about Christ right now, will you respond?” This simple invitation is all John the Baptist responded to, and I believe it is the essence of what God asks of us each day. John dared to live into the reality of who God said he, in his true humanity, was. God asks us simply to do the same, to lean in toward our God-healed selves. We aren’t Jane Austen characters; we won’t see the full picture of our lives or know our full purposes ahead of time. But God asks us to live in response to all we know about who Christ is, and God asks us to let him change our lives accordingly. He asks us to notice that we cannot be fully human unless we realize humanity was made full already. May we know God, and may we truly know ourselves. 1. Take time to discover how God is reshaping your life. Think of three ways you can presently feel God’s work in your life. 2. Ask God to give you a glimpse of his view of this day. 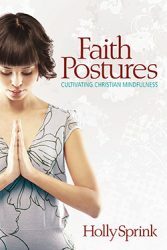 This post originally appeared as chapter 2 in Faith Postures: Cultivating Christian Mindfulness by Holly Sprink.